I like to make this recipe when Laura and I are really short on ingredients – usually the day before we do our grocery shop! It only requires a few items (if you’ve got some potatoes, cauliflower and cilantro you’re almost there!) The dish only takes 25 minutes to prepare and cook, which is great for a busy work night or when you fancy a lazy night in front of the TV. 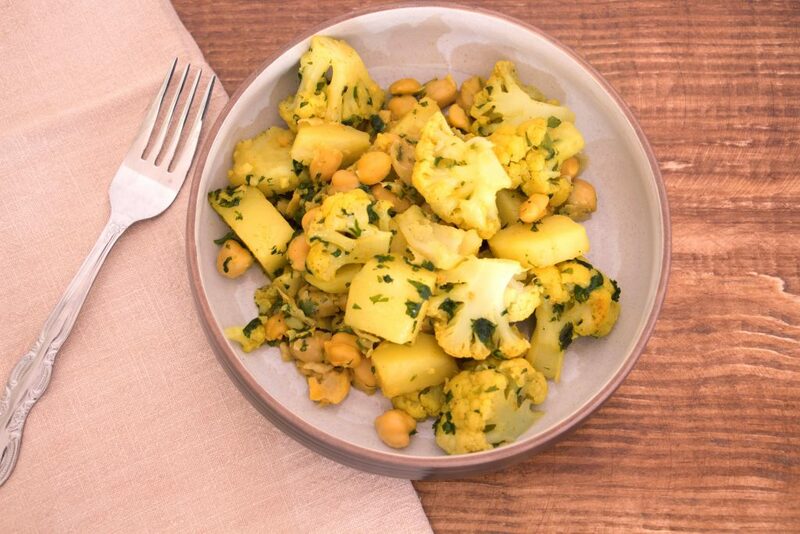 Aloo gobi is also a great healthy options for when you fancy Indian food – there’s no cream or other heavy ingredients that you’d usually expect from Indian curries. 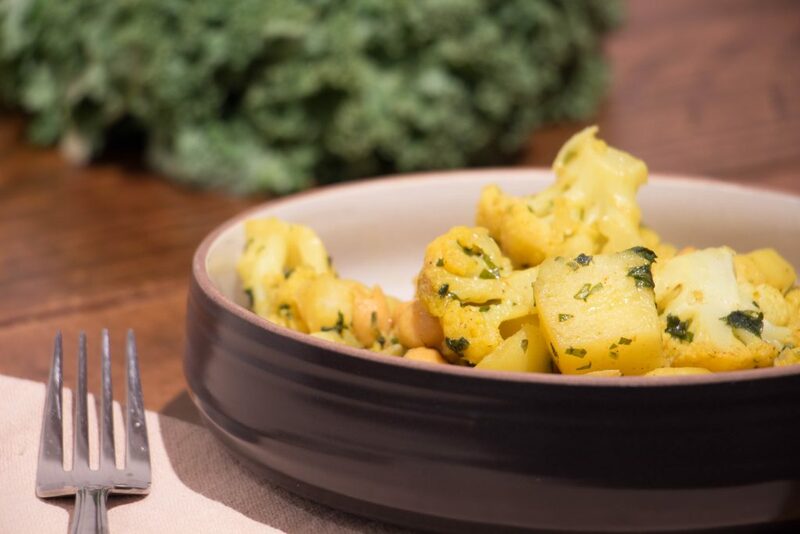 Each serving of this aloo gobi has only 3g of fat but has more than half of your daily fibre and a quarter of your daily protein. Even better, it keeps really well, so you can store it and use for lunches for the rest of the week. Tumeric is the dominant flavour in this dish – it’s also what gives the aloo gobi its distinctive colour. 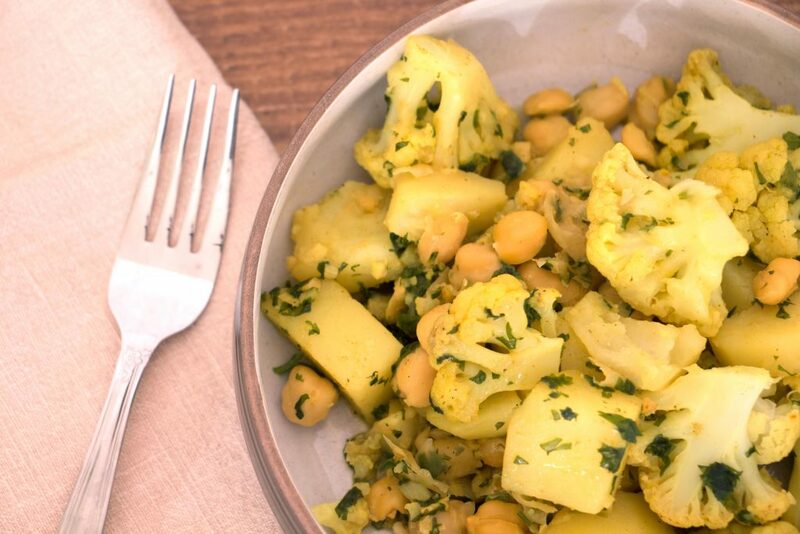 I’ve also added chickpeas to this recipe because they add another texture into the mix and give the dish a little more body. Begin be placing a deep saute pan on a medium-high heat and pour in the canola oil. Add in the ground coriander, turmeric, garlic and green chilli. and fry for around 40-50 seconds. This is going to form the spice paste which will be used to flavour dish. Next, add in the potato, cauliflower and cilantro and mix together really well, so the cauliflower and potatoes takes on the nice yellow colour of the spice paste. Then add the 1/2 cup of water and the chickpeas, give it all a good stir. Bring the water to the boil, then turn the heat down, cover the pan and leave to simmer for 15 minutes. Serve up in a large bowl with a small sprinkling of chopped cilantro.